Show us your Nook! Or your pretend-Nook, if you don’t have a Nook. From now through Dec. 31, a bunch of authors, including the one attached to my fingers, are giving away a free ebook from Book View Café. All you have to do is visit Katharine Eliska Kimbriel’s Live Journal page at http://alfreda89.livejournal.com/. She has the instructions there. The idea is you post a picture of yourself with your Nook to Cat’s Livejournal or Facebook page, and in return you get some coupon codes for free books. Just go to Book View Café to collect. Nothing to register—just use the coupon codes to download epub editions of the books. I’m giving away Eternity’s End, a Nebula finalist. You’ll also get Cat’s Fires of Nuala, Vonda N. McIntyre’s Starfarers, and Jennifer Stevenson’s King of Hearts, all in DRM-free epub editions. (Which means, among other things, that if you have a Kindle pretending to be a Nook, you can easily convert the epub to mobi-Kindle format with Calibre, a free program.) See Cat’s page for a list of other participating authors. 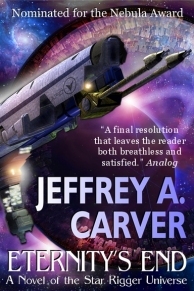 Here’s where you can go to collect your epub copy of Eternity’s End once you have your coupon code: http://bookviewcafe.com/bookstore/bvc-author/jeffrey-a-carver/. Hurry! Before we run out of ebooks! E-book readers can download free e-books from Obooko in PDF, Kindle or in ePub format.